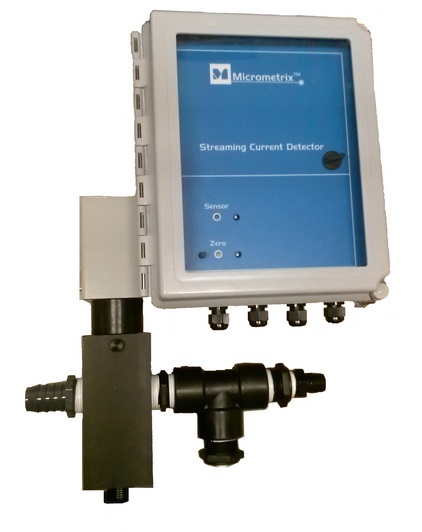 The Streaming Current Detector / Transmitter Model SCD-T is designed to be used with the Streaming Current Controller Model SCC. It is also compatible with Process Controllers/Analyzers, PLCs, and SCADA that accept a 4 to 20 mA signal. The Model SCD-T includes an integral streaming current sensor and electronics transmitter with gain and zero offset functions. Two flow-through probe/sensor configurations are available, the standard probe is rated at 1 Liter/min and the optional High Flow Probe (as shown) is rated at 5 GPM. Both probes are “User Serviceable” and feature a replaceable Teflon® sleeve. Streaming Current Detectors (i.e. SCM/SCD) have demonstrated the ability to optimize coagulant dosing and prevent plant upsets.